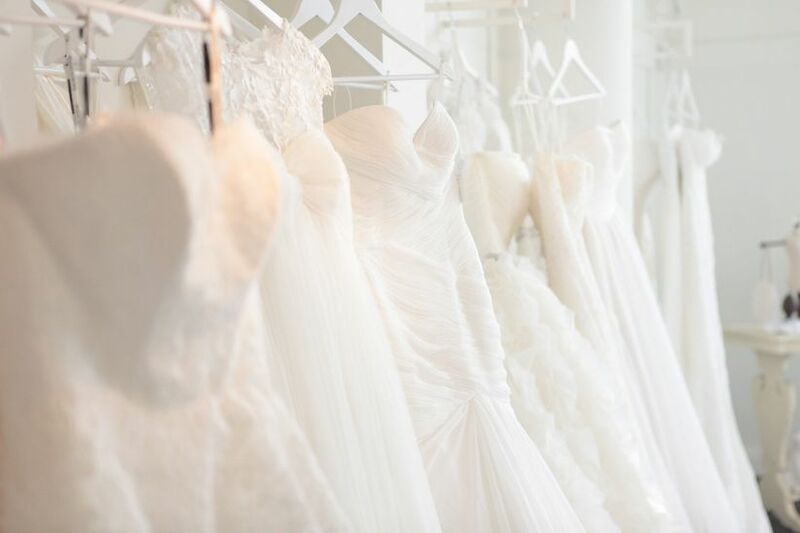 5 Things Every Bride Should Know About Wedding Dress Shopping | Wedding Ideas ARE YOU A VENDOR? From budget to style, here are a few things you should keep in mind before and while you shop for the dress of your dreams! 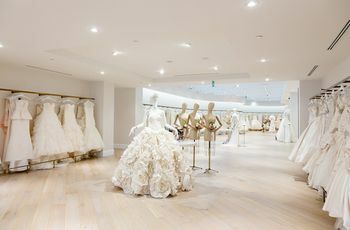 If there's one thing you should know about wedding dress shopping, it's that it is much different than mall shopping. Wedding dresses aren't meant to be purchased off the rack the way a pair of jeans are, so you shouldn't approach your shopping experience in the same way. We've outlined a few things we think you should know before and while you shop for the dress of your dreams. Whether you or a family member will be picking up the bill for your wedding day attire, make sure you have a clear number in your head. There's no specific amount you should or shouldn't spend on your dress, it's completely up to you. We suggest thinking about what your wedding priorities are and allocate your budget toward those things accordingly. If your dress is one of them, feel free to set a higher budget. If other things are more important to you, then consider spending less on your dress. No doubt you'll have endless options of beautiful gowns at every price range, so don't worry about missing out on certain dresses. 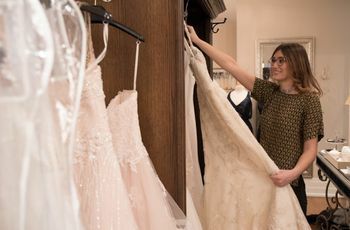 Make sure you are open and honest with the bridal stylist about your limit so you don't end up trying on a gown you love that's way too expensive. 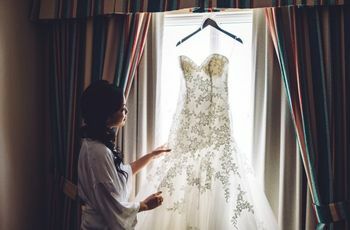 Keep in mind that you'll likely need alterations on your dress and want to incorporate accessories that cost extra so keep that in mind when setting a budget. It's definitely important to do your research before you begin dress shopping, so you can get a feel for what kind of dress you might want. With that being said, don't limit yourself! The stylist you work with is a pro, and they might have the perfect gown in mind for you. Often times brides walk into salons thinking they know exactly what they want, and walk out with something they never expected! Remember to stay open minded and let the pros help you out in any way they can. Like we said above, wedding dress shopping isn't like regular shopping, and neither is the sizing. Wedding dresses run smaller than off-the-rack clothing so don't be surprised if you step into, say, a size 10 when you're typically a 6. 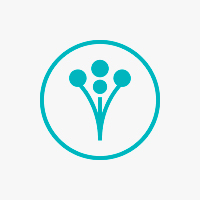 Our advice is to focus on how you feel when you put the dress on instead of focusing on numbers. What's important is that you look and feel your best! Don't be discouraged if your dream dress doesn't fit you right when you put it on. The gown you're trying on is a sample size, what the designer sends the salon for brides like you to try on at the store. These gowns aren't supposed to come home with you the same day you try them on. The stylist will take your measurements and send them to the designer so they can make the dress from the ground up to fit you perfectly. You'll have to come back for a couple more fittings after that (or go to another store if your salon doesn't do alterations in house), to make sure everything fits just right. 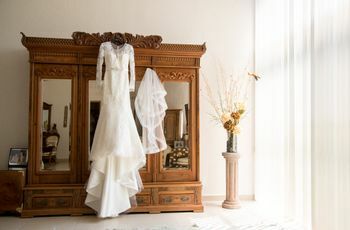 This process can take many months so we recommend you start wedding dress shopping 7-8 months before your wedding so the designer and seamstress have enough time to get it done without rushing. Despite what reality televsion teaches us, the big moment when you decide what dress to walk down the aisle in may not evoke a huge emotional reaction. You might decide after trying on a bunch of them that a specific one flatters you the best, or you might pick one you can't stop thinking about. The bottom line is, there are dozens of different ways to react to finding "the one" and it might not involve any tears.